It’s a never ending struggle, a numbers game. 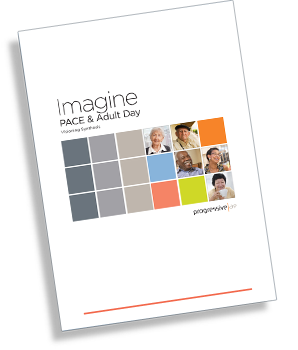 Colleges and universities with the biggest and newest offerings compete for the best and the brightest students. Schools today are constantly looking for new ways to draw students on-campus, and Michigan State University’s (MSU) Brody Square doesn’t disappoint. 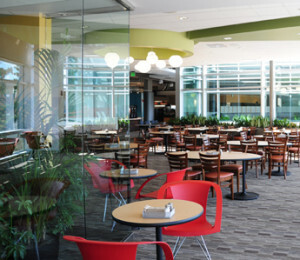 The design intent of Brody Square’s renovation was to create a sustainable space which was new, fresh and welcoming, as well as to create a destination dining experience not typically associated with residential dining halls. According to reviews and a dramatic increase in daily dining numbers, the space certainly delivers. Since opening the renovated space, the daily number of diners has swelled from 2,300 in years past, to an average 7,300 meals a day – far exceeding any past figures and current expectations. Dining facilities are revenue generators for colleges and universities, and attracting students and visitors who will purchase meals outside of a student meal plan is a bonus. However making these things happen can be a challenge. By providing a comfortable and welcoming environment for commuter students, faculty and the community-at-large, is a great place to start. The recently LEED Gold certified Brody Square features 80,000 square feet of space with seating for more than 1,000. There are nine different mini-restaurants available on the upper level with a café and convenience store on the lower level. The design team took Brody to a new height by also including a demonstration kitchen and 10 distinct seating environments for every dining preference. Recently, a new tradition has been born on campus where popular coaches Tom Izzo, Mark Dantonio, Sally Merchant and others spend the first day of spring finals week in Brody Square serving the student lunches. 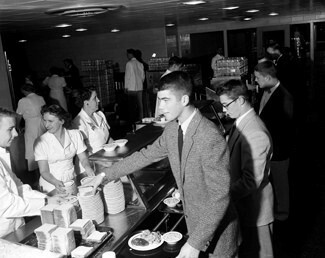 Seen as an opportunity to interact with students and thank them for support of the athletic program, this once a year event has been responsible for a single day record of 8,300 diners. Imagine having Tom Izzo offer you a slice of pizza or Mark Dantonio dipping you a cone of ice cream! The coaches have also made Brody the go to spot for prospective athletes visiting campus. 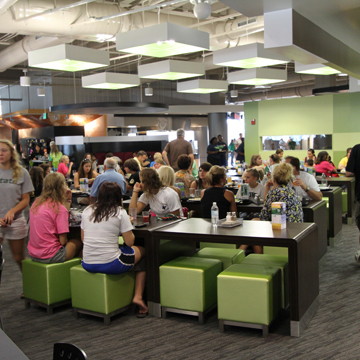 The campus tour can be a game changer, and the dining facility can have a big impact on a prospective student’s view of the institution as a whole. 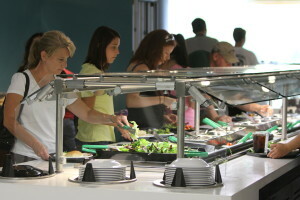 With Brody Square, MSU has also extended the everyday uses of the dining hall to include staff recruitment, summer camps, student organizations and athlete recruitment. Let’s face it, the more appealing the campus, the more students will wish to live on campus. And dining options are often central to this decision. With housing costs rising, students are often looking for greater value and more incentives to live on campus. A large percentage of young adults prefer the convenience and variety of high standard, cooked-to-order food after a long day of class rather than worrying about cooking. 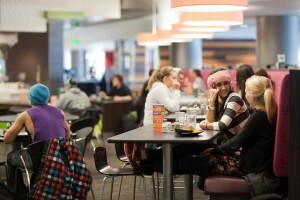 A great facility can make dining on campus more worthwhile, and also encourage socialization. And from a business perspective, the influx of student diners has a positive impact on the bottom line. To learn more about our student dining expertise, or how Progressive AE can help your organization reach similar success, please contact me. 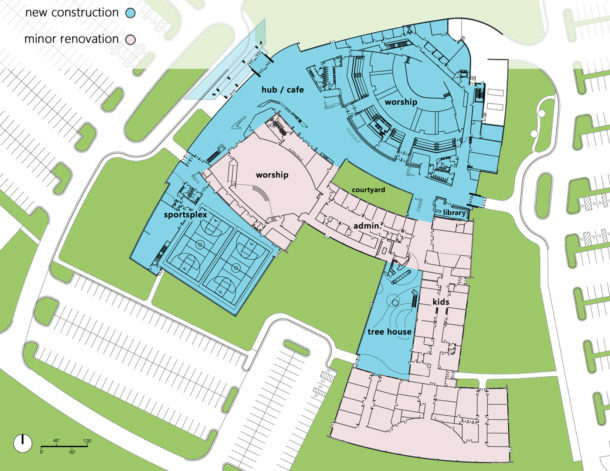 See more about MSU Brody Hall here. Learn more about the latest housing trends directly from the experts, plus receive valuable market insights and find out how Progressive AE can help drive housing development performance.